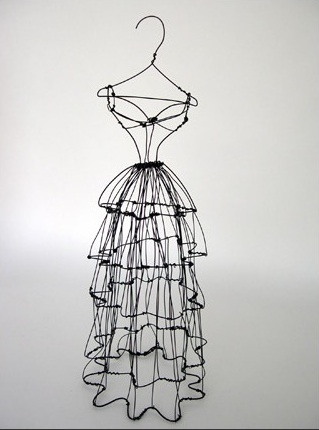 Nancy sent me the link to the artist above, Leigh Pennebaker (warning, Flash-heavy site; easier to read about her here) who makes wire form dresses. I think this one is called "Bridget." Theresa sent this, but it was forwarded to her without a good attribution; if anyone knows anything about the artist will you tell me, so I can link it here? http://www.cmog.org/index.asp?pageId=802scroll down and see Karen Lamonte’s glass dress. Amazing. Six or so years ago I was in Toronto and got to see a marvelous exhibit of works by Isabelle de Borchgrave entitled “Paper a la Mode”. 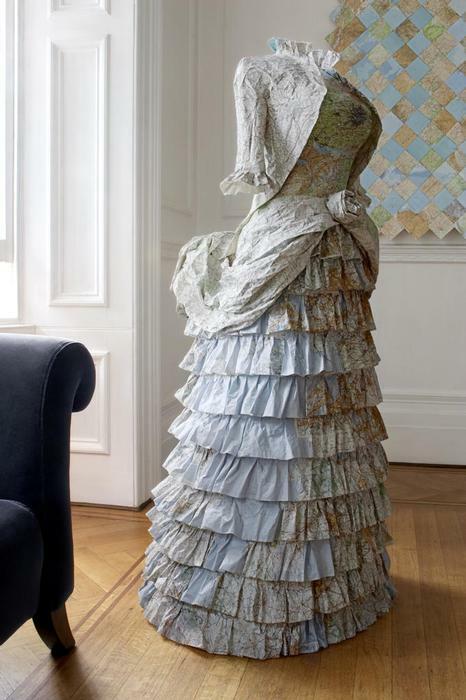 It consisted of dresses and other garments made entirely of paper. It was just stunning. I have the exhibit catalog but haven’t been able to find a link to the exhibit anywhere online. If you ever get the chance to see it, GO!! Aha! Found it after all.http://www.isabelledeborchgrave.com/en/projects_4.cfmYou'd never believe it was paper. 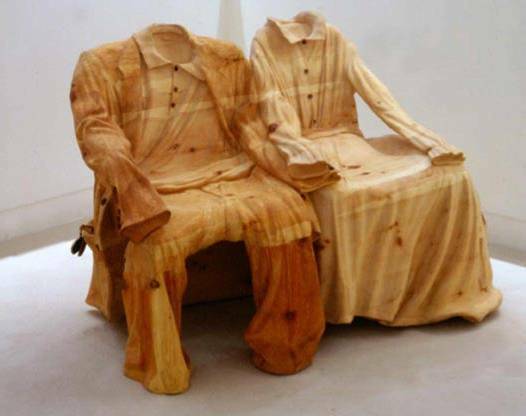 Longtime reader de-lurking to say that the wooden clothing is by the amazingly talented Livio De Marchi:http://www.liviodemarchi.com/ukmain3.htmTake a look at his full gallery–it’s worth it. Jana Sterbak does some great work. If you go to http://www.janasterbak.com/images.html and click on Remote Control in the pulldown menu you will get to a fabulous piece based on a crinoline. Lovely stuff. Nicole, I checked out some of your work. Incredible. I put youre page in my favorites. If you google “Dress Signal” you can see some of the work in an exhibition from 2003 at the Art Gallery of Mississauga. My boyfriend’s grandfather creates Victorian and Edwardian dresses for doll forms. They are truly amazing and intricate, and I wish there were more/better photos up on his site.There’s a few more photos of his bridal pieces for the dolls here [PDF]. Anna Eggert is an Australian artist who makes dress sculptures from wire mesh pounded with river stones. Her work can be seen here: http://www.beavergalleries.com.au/In the flesh (wire?) it has a really interesting effect – it looks soft and flowing until you get very close – and then you realise that the fabric is quite harsh metal. I read this entry, then purely by accident walked past the Zenith Gallery. There were a few pretty dresses in the window made from food wrappers- including a cute apron made of shortbread cookie labels… The gallery is downtown, between the Navy Memorial and Chinatown metro stations. thank you welmoed for the link to the paper dresses show. i also saw this exhibit when it was in toronto and it was fantastic. i really appreciated that the artists realized that their technique with paper was so convincing that people would feel compelled to touch, which is a no-no of course, so they had a table set up with samples the public could actually handle. i was in 7th heaven! Lesley Dill uses the dress form often. Here’s one of my favorites: http://www.newpaltz.edu/artsnews/news.cfm?id=2755But also do a Google Image Search on “Lesley Dill dress” and you’ll find her Poem Dress and other works. Another artist who has recently making dresses, out of ceramic elements, is Gulf Coast artist Lee Renninger. She hasn’t posted the new work on her website, but you can see a sample on my blog: http://yoredux.blogspot.com/2007_01_01_archive.htmlif you scroll down to the 1/22/07 post. 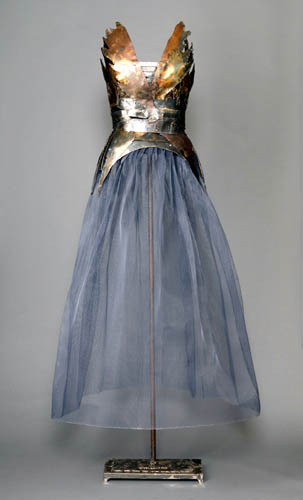 Arabella Tattershall makes exquisite, life-size dresses of metals and meshes. Denise Perreault (www.deniseperreault.com) is a bead artist who creates dresses and curtain fabric from tiny glass seed beads, and Shelly Hamill (www.shallyhamil.com) uses mosaic to create stunning dresses. All artists are from Colorado, USA.